POI-3250 (Colonel Harland David Sanders) making a public appearance in December 1974. Special Containment Procedures: A sample of the original Kentucky Fried Chicken "Eleven Secret Herbs and Spices" is to be kept in a standard Safe-Class item locker in Site-88. A digital copy of the recipe is available on the Site-88 database. 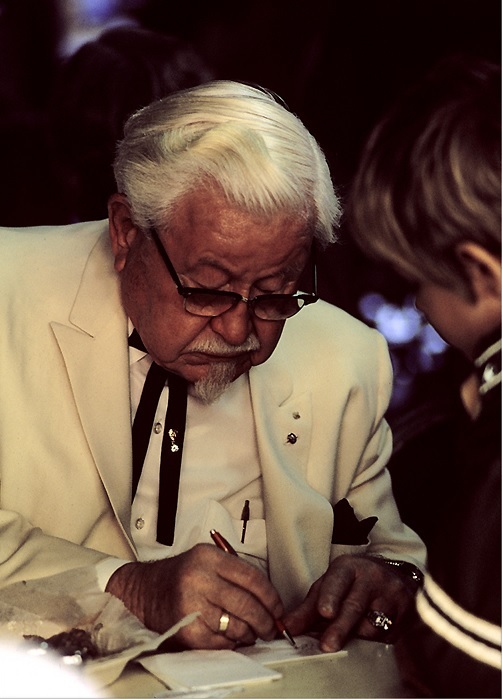 Widespread reproduction of SCP-3250's effects has been made impossible due to the exclusive rights of Kentucky Fried Chicken to market and sell chicken flavoured with its trademark secret recipe, as well as the acquisition of the ██████████ Family Plantation through a Foundation front and the subsequent monopoly established on the ██████████-variety peppercorn. Public knowledge of the substitution of Kentucky Fried Chicken's secret "Eleven Secret Herbs and Spices" recipe is to be suppressed. Description: SCP-3250 is a perceptual anomaly affecting individuals who have consumed pressure-cooked fried chicken seasoned with Kentucky Fried Chicken's proprietary "Eleven Secret Herbs and Spices". For a period of time after consumption, people affected by the anomaly will perceive depictions of Jesus Christ as being altered to resemble American businessman and restauranteur Colonel Harland David Sanders, clad in his trademark white suit and bolo tie. Altered depictions will be of similar art style to the original. All manner of visual depictions are affected, including secular depictions. The perceived degree of resemblance between depictions of Christ and Colonel Sanders diminishes with time, fading completely after one to two hours following consumption of a typical three-piece chicken meal. Consuming larger quantities of chicken results in this effect persisting for longer. An upper limit to this effect has been reported at approximately 72 hours following consumption of an entire 20-piece chicken bucket in one sitting. Based on analysis of Kentucky Fried Chicken sales and church attendance in the United States, it is estimated that at least 150,000 North Americans have at one time been affected by SCP-3250 since the first reported case of the anomaly in January 1974. Reports of manifestations outside of the North American continent have been sparse, likely due to substitution of the highly-perishable and locally-sourced ██████████-variety peppercorns used in the seasoning recipe in foreign markets. The majority of SCP-3250 cases are believed to remain unreported due to the temporary nature of the effect and the natural human tendency to preserve normality and maintain a consensus reality. 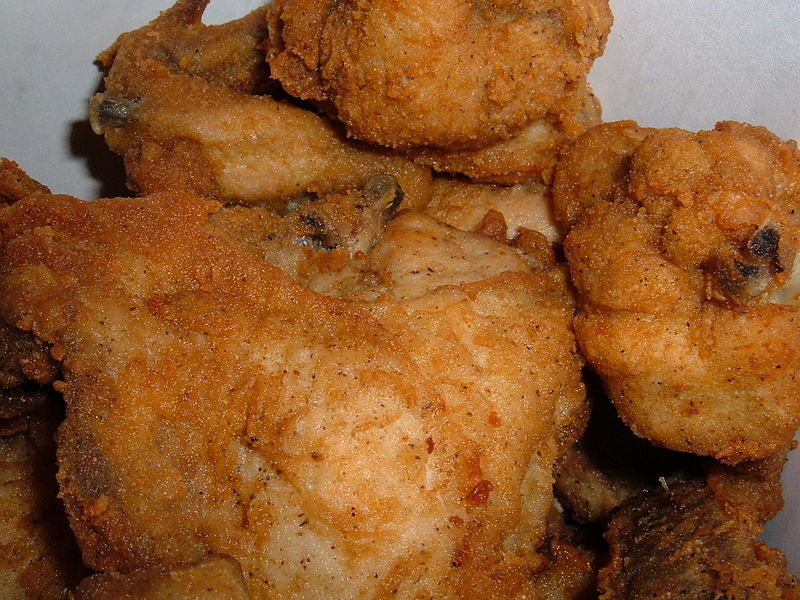 SCP-3250-positive fried chicken as prepared in the Site-88 laboratories in 2009. History: Prior to identification of its source, knowledge of SCP-3250 was suppressed through localised distribution of amnestics whenever encountered by field agents; this was sufficient to catalyse self-suppression among affected members of the populace. Extensive testing conducted by Site-88 researchers determined the factors for its cause in 1974. Full-scale containment of SCP-3250 was soon enacted, culminating in the infiltration of Kentucky Fried Chicken's Louisville headquarters by a joint Foundation-UIU task force in April 1975. Embedded agents were successful in accessing the locked safe containing the anomalous recipe, and replacing it with a gustatorily similar substitute. Contracts with Griffith Laboratories and McCormick & Company were also altered accordingly by covert agents, allowing the replacement recipe to propagate throughout the North American supply chain in a matter of months. Total containment of SCP-3250 is believed to have been completed by October of the same year. In December 1975, following his public statements on the altered quality of Kentucky Fried Chicken's recipes (refer to Document-3250-H-066), Sanders was designated as POI-3250 and placed under covert observation. A settlement was privately reached with Sanders in 1976 through Foundation contacts in Heublein Inc., then-parent company of Kentucky Fried Chicken, offering a payout of $1 million USD as compensation. Regardless, Sanders continued to publically denigrate the quality of Kentucky Fried Chicken's culinary standards, and maintained the assertion that his original recipes had been altered by Heublein Inc. until his death in 1980. Investigation into Sanders and his association with esoteric clandestine organisations continued until his death in 1980, finding nothing unusual in both his history and former ties. It was concluded that Sanders was neither aware of nor responsible for the SCP-3250 phenomenon. Sighting Details: Three patrons of the ████████ Church in Biloxi, Mississippi claimed to have seen a depiction of Colonel Harland David Sanders in the stained glass windows of the church. As this sighting was not shared by any other church patrons, it passed without incident. This is the earliest recorded sighting of an SCP-3250 manifestation. Sighting Details: 56-year-old Howard Brooks of Hialeah, Florida reported the theft of a Renaissance-era painting of Jesus Christ in his holiday home and its replacement with a painting in similar style of Colonel Sanders. As the SCP-3250 manifestation was observable only to Brooks alone, it was ignored by local authorities. Subsequent investigation by UIU agents revealed that Brooks had consumed Kentucky Fried Chicken for lunch. A connection was noted between this anomalous occurence and eleven others, leading to the UIU's initial classification of the SCP-3250 phenomenon. Foundation assistance was later requested due to the scale of the phenomenon, which was estimated to be too large to handle with existing UIU resources alone. Sighting Detains: D-01776 was served a three-piece meal of Original Recipe Kentucky Fried Chicken and directed to consume it, which she did in one sitting. D-01776 was then shown a statue of Christ on the cross, and asked to describe it. D-01776 reported the statue depicted a crucified Colonel Sanders grimacing in pain with boiling palm oil oozing from his wounds. This was the first successful replication of an SCP-3250 manifestation in containment. Efforts to alter the "Eleven Secret Herbs and Spices" recipe began. Sighting Details: A group of twelve tourists in Rio de Janeiro, Brazil, reported the alteration of the statue of Christ the Redeemer into an equally-sized statue of Colonel Sanders with arms outstretched and holding a fried chicken drumstick in each hand. The tourists were investigated by Foundation agents, who learnt that they had shared a meal of Kentucky Fried Chicken at the Dallas-Forth Worth International Airport two hours prior to their departure. This is so far the only recorded SCP-3250 manifestation outside the North American continent, and was successfully covered up through use of Class-B amnestics. Sighting Details: In the largest sighting to date, ███ civilians in the town of Van Gogh, Iowa reported a "fifty-foot high" sighting of Colonel Sanders in the sky above their hometown shortly after a church service. The apparition remained for twelve minutes before dissipating. It was later determined that Kentucky Fried Chicken had been supplied for mass catering at the church's lunch buffet. This is the largest known sighting to date, occurring shortly before the successful replacement of the original recipe. The resultant mass hysteria caused by this sighting is documented in Incident Report 3250-100-927. Incident summary: Reports of missing truckers in the vicinity of CR W66, Louisa County, Iowa are traced to the town of Van Gogh, population 146. The responsibility for investigating the disturbance was assigned to the Federal Bureau of Investigation's Unusual Incidents Unit (UIU) due to local Foundation resources being diverted to the mass cover-up of SCP-3250. On 09/08/1974, UIU Special Agents C. Lewis and D. Tucker are eventually deployed to the locale. At 0930 hours, the agents report discovering the wreckages of 7 tractor-trailers in a runaway truck ramp 1.2 miles from Van Gogh. Investigation reveals the severely burnt and decomposed remains of the missing truckers. Judging from the evidence present (namely, char stains on the passenger seat and driver's seat, the lack of any burn damage to the vehicles, signs of forced entry via blunt instruments, and the cinderblock bricks duct-taped to the gas pedal of each vehicle), Agent Lewis surmises that the truckers were immolated after exiting their vehicle and placed back into their seats, after which their vehicles were sent on cruise control down the highway until they each crashed into the ramp. At 1010 hours, Agents Lewis and Tucker report a strong smell of burning oil and Kentucky Fried Chicken. Throughout this, a loud crackling is heard in the background. Agent Tucker claims that the crackling sound is not due to radio static. Radio contact is soon lost. Contact is only reestablished at 1021 hours, with severely reduced audio quality. Agent Lewis checks in, reporting that their car was ambushed by an improvised grease-based incendiary trap, and that sporadic gunfire from unseen assailants forced them to abandon their vehicle and proceed on foot. They find shelter in an empty house, further reporting that the majority of houses in Van Gogh appear to be devoid of occupants. Agent Lewis disobeys their direct order to remain in place and leads Agent Tucker on to investigate the situation. They proceed to move from house to house, narrowly avoiding a patrol of men and women clad in golden-brown cloaks and armed with hunting rifles. Meanwhile, UIU local command links up with Foundation contacts, explaining the situation. In conjunction with UIU Special Agent K. Milford, MTF Pi-46 (The King's Men) is mobilised to secure the town of Van Gogh. At 1029 hours, loud crunching noises are heard. Agent Tucker reports that the ground nearer to the town center is covered in deep-fried chicken parts. Upon closer inspection, the chicken parts appear to be carefully arranged so as to point towards the town's Southern Baptist church. The agents proceed to approach the church to investigate. At 1034 hours, another set of crunching noises are heard in the distance. Soon, the radio feed is cut. Following this, no further radio contact can be established with either agent. The armed convoy bearing MTF Pi-46 sights Van Gogh at 1200 hours, confirming the presence of the crashed tractor trailers and the burnt wreckage of the agents' car. Civilian resistance surrenders quickly at the sight of the convoy, believing them to be National Guard, and are quickly subdued with Class-A amnestics. Agents Lewis and Tucker are found alive in a ditch adjacent to the burning church, where they had taken shelter following the detonation of an improvised explosive device. Both agents are treated for minor smoke inhalation, but otherwise suffer no injuries. Paraphernalia depicting Jesus Christ, ranging from pendants to crucifixes, defaced to appear as Colonel Sanders. Handwritten photocopied flyers, advertising "The Reformed Church of the Colonel". Five tonnes of chicken, both raw and deep-fried. Two tonnes of original recipe "Eleven Secret Herbs and Spices", found stashed in various homes. A marble font, equipped with a heater and filled with oil, apparently acting as a deep fat fryer. A King James bible with the majority of the words blacked out with marker pen- the remaining words describe the "Eleven Secret Herbs and Spices" recipe. Object was located inside a locked safe beneath the pulpit of the local church. A large amount of assorted armaments, including hunting rifles, handguns, homemade incendary bombs, and one leaf blower converted to spray boiling oil. 146 residents of Van Gogh dressed in golden-brown oil-soaked rags, bearing various degrees of burn injuries. They were able to provide consistent details of SCP-3250 sighting #458, but could not remember anything else afterwards. One human corpse affixed to a wooden crucifix and coated in deep-fried "Eleven Secret Herbs and Spices" batter. Corpse was an identical visual match for Colonel Harland David Sanders, who was at the time alive and under Foundation surveillance in Abbeville, Louisiana. Genetic sampling of the corpse returns a perfect match for Gallus gallus domesticus, the domestic chicken. Origins of corpse and reason for its genetic makeup remain unknown.